The writers are contributors to Writers on the Range, the opinion service of High Country News. Auden Schendler is senior vice president of sustainability at Aspen Skiing Company. Jeff York is associate professor of strategy and entrepreneurship at the Leeds School of Business, University of Colorado, Boulder. Climate hawks fired back: “2017 was the second-hottest year on record.” But as much as we’d like to think political discourse is about ideas, it seems much more about defending your tribe. And on no issue is this more evident than climate change. Many Republicans simply can’t support climate action — not because they don’t believe the science, but because it would represent a breach of cultural identity, akin to wearing a Che Guevara tank-top to the gun range. The left often ignores this dynamic — the sense that climate is a proxy for an entire tribal worldview encompassing issues like abortion and the size of government. But it doesn’t have to be this way. Climate solutions exist that cut through cultural biases. As Hoffman, a leading researcher on the climate cultural divide points out, climate change is so polarizing that it can actually appear to challenge some people’s belief in God. Social science shows that factual arguments don’t work; they just push people further into their corners. Yet the climate movement continues to ignore the culture barrier. Meanwhile, a record number of voters — 63 percent — now say they worry about global warming, according to the Yale Program on Climate Change Communications. So how do we move forward? Vice President Joe Biden and President Barack Obama speak with Namaste Solar CEO Blake Jones in Denver, Colorado in 2009. New research by Jeff York and his colleagues, to be published in the Academy of Management Journal, studied how local culture can influence the adoption of climate-change solutions. They tested different approaches within two communities: those with a Republican “market logic” that prioritizes economic profits and self-interest, and others with a Democratic “community logic” more concerned with individuals’ responsibility to the world we all live in. The only approach that had a statistically significant impact in increasing the adoption of solutions in both communities involved emphasizing entrepreneurship and business development. 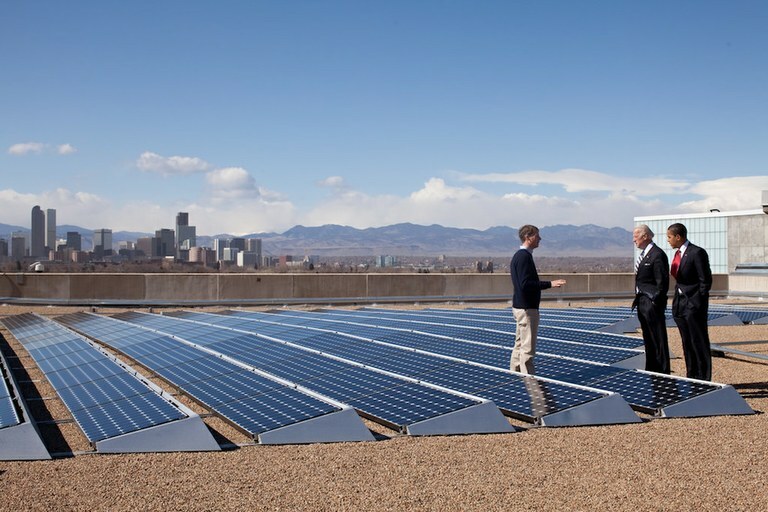 For example, Namaste Solar, founded in Boulder, Colorado, has become a national business. But culturally, it is just that —a business — not a radical or polarizing political platform. With this in mind, climate activists might want to change tactics, particularly in conservative regions. Rather than pursuing the usual policies of light bulb rebates, tax breaks for green buildings or some new regulation, an entrepreneurship approach might instead invest in local businesses connected to climate change. How can we help develop more businesses like Window Savers in Lyons, Colorado, for example? It restores old windows, which reduces heating bills and saves energy. Entrepreneurship, unlike rebates, doesn’t pay out money never to see it again. Instead, it builds the local economy. Unlike a policy push, it would also come with buy-in from both sides of the cultural divide: “Community logic” likes the goal, while “market logic” likes the approach to getting there. Sure, new businesses could fail, but even the attempt would help unify the community, not divide it. While this approach is slower than climate activists might want, it paves the way for eventual policy fixes by defanging climate solutions as a whole. For instance, The New York Times Magazine reported that wind-energy employees in Wyoming may oppose the broader climate movement, yet getting a job in the wind-energy business is considered perfectly respectable. Perhaps the development of a successful economy around what used to be a fringe and divisive issue normalizes the practice of trying to find solutions to climate change, making it more accepted and embraced. For conservatives, the message is: Why shy away from economic opportunity? For liberals, it’s: Here’s actual progress on an issue that has been viciously difficult to move the needle on. Because time is of the essence, and the science is increasingly dire, there is clearly still a need to push for climate policy solutions — no matter how hard they are to pull off. But meanwhile, let’s promote any actions we know will work.